* All photos courtesy of blogger and friend, Jess Nichols, of Sweet Eventide. I don't have much time to write this post. There is bread rising on the counter that will need to go into the oven. The dehydrator is whirring with a neighbor's persimmons. Dried beans from our front yard garden soak in a bowl next to the sink. Butter softens next to the stove - a prime suspect for this afternoon's cookies. Eggs await in a cooler at a friend's house - a drop for pastured, local eggs. The farmers' market is tomorrow and I need to make my list, peruse my cookbooks, leaf through favorite recipes. I wonder what might be there. Broccoli and potatoes for sure. That sounds like soup! Spinach and beets. Maybe a salad? Pasta sauce that I made in September will need to be pulled out of the freezer. A jar of blackberry jam goes into the fridge. And those pumpkins lurking by the front door - those 128 pounds of pumpkins that we grew in our garden - those will need to be dealt with. There are peeps emanating from the garage. No doubt water to be changed, feed to be added and soft, tiny bodies to be cradled. (Yes. I've got chicks! That's Fluff, Serena and Butterscotch up above and Willow and Lollipop down below). It's a cold November morning and there is laundry to be done. There's a chill and so I put on a jacket and some slippers. I leave the heater set at 64 degrees and tiptoe out to turn the sprinklers down on the vegetable garden and off on everything else. A tangle of yarn and double pointed needles poke out of my purse, demanding to be transformed into a teddy bear (shhhh!) for Christmas. There's the stack of knit wool hats to be sold at the craft faire to raise money for my son's school. And also some recycled crayon Christmas trees. What should we charge for those, I wonder? My son's robot costume - the winner of a green Halloween costume - looms on the dining room table; a ghost caught between our home and the recycle bin. A jar of cast off buttons waits on the kitchen table. That, two kids and a bottle of glue and we've got grandma's Christmas present. Today, I am to write for the APLS Carnival, though. To talk about whether I've been able to change a behavior I initially thought I could not - in the name of sustainability. I think about how I, a lover of all things Target - the shiny red carts, the knock off clothing, the holiday knick knacks, stopped shopping. About how I, an eater of Lean Cuisine, went "from scratch" on everyone. About how I turned my nose up at Halloween candy and gave most of it away because, honestly, after a year of eating home-baked goodies, a Reese's peanut butter cup really doesn't taste that good. About how it I, who adored convenience, looked blankly at my brother-in-law when he asked for a paper towel. A paper what? The truth about "going green" though is that it doesn't happen all at once. You don't wake up one morning with a fully formed victory garden outside, a pantry full of home-canned preserves and an Amish buggy in the garage. You start with something small and then take another step and another and another until suddenly you are somewhere you never thought you'd be doing things you never thought yourself remotely capable of (ahem, baking artisan bread). Don't think about where you are going. Just what the next step is. Whether it is moving from conventional produce to organic to the farmers market to growing your own. It's the thousand mile journey that begins with a single organic apple. At least that's how it happened for me. Now, if you'll excuse me, it's my turn to pick up the carpool and I need to empty the compost before I go. If you'd like to weigh in, check out the carnival topic details here and submit your post to steph@greeningfamilies.com by November 15. Or pop over to Greening Families on November 18th to read what other APLS have to say about making changes in the name of sustainability. Love the chicks! Enjoy your journey, it sure is fun. I LOVE reading your posts, I had a nudge to get back to baking bread a day or two ago, maybe I can whip up a batch of dough before I head off to work this morning ... Thanks. Thanks for posting this. What you've outlined is what I want, but it's hard not to get discouraged because you can't do it all at once! What you write is so true! I just gave up coffee (two weeks ago). Something I stubbornly refused to give up, but that probably did the biggest number on my food miles! Small, I know, but in the end it has been really easy, I feel more energetic, an now it will be added to my list of occasional foods, treats so to say! 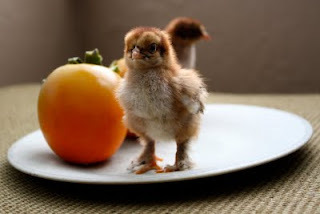 Your chicks are ADORABLE! I know I never thought I would have worms in my kitchen, travel with my own eating utensils - including glass straw - or, mow my lawn with reel mower when a perfectly good rider sits in the garage, but I do and it seems normal now. To think it all started by stumbling across EWG's Skin Deep database two years ago. I just wanted to know what all those long words on the back of my shampoo meant. My how things have changed! Great post! Yes, it's a journey. And step by step, we've gone a long way. Husband made a great green bean dish a few nights ago: garden beans from the freezer! What a great feeling. (Word verification is WEEDMI) Weed me? Is my garden calling? what are you making with the buttons? The Mom: It sure is, isn't it? Tammy: Thank you! Hope you had a chance to whip up some dough. Mad Woman: Please do not get discouraged! You really cannot do it all at once and we all of us started with a CFL or a reusable tote. Alison: I bet you would never have guessed that you would give up coffee a few years ago? Sheeep: Hm, so that's how you started out, huh? We should do a post sometime asking what everyone's gateway drug was. I love hearing how people's journeys started. Daisy: Yes! That is your garden calling. Ignore it, though. It's winter. :) Or close enough. Knitting woman: A wreath. Click on the link (where I write about the buttons) for some cute photos. Any other ideas as I've got a load of buttons? 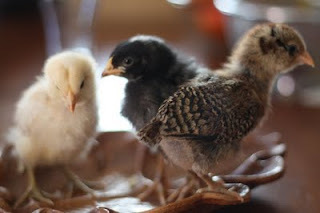 I love this post and those chicks are adorable. :) Can't wait to see where you're going next on your 1000 mile journey. I think we're at about mile 50. You can make a button bracelet by heating a needle in a candle flame, using the hot needle to make holes in the edges of a pile of buttons, and then using jump rings to attach them to a chain bracelet. What a beautiful evocation of the small moments that add up to change. A journey of a thousand miles begins with a single step. And it is such a meaningful, rewarding, rich journey. I haven't been to Target since May, and sweets in little packets just taste like chemicals now. I revel in the satisfactions that abound: the yolks from our hens are marigold orange and the bread rises on the power of yeast we captured and the stars are bright in the sky when we bake in the outdoor oven. I love reading your beautiful posts and knowing that ours is a shared journey...shared with friends we've never met but who know what we know. Thank you! Dehydrated persimmons? Are you using the pointy kind or the fuyu flat little guys? I've never had a dried persimmon but I love the fuyu variety. You're so creative. And making a teddy bear! Too good. Beautiful post. 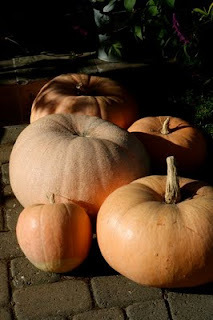 128 pounds of pumpkin: oh my. Those pictures of your chicks (congrats!) are divine. Your life sounds blissful. Elizabeth: Now that's a cool idea! June: Oh, I so feel that same way! Everything you said, me too! Katrina: The pointy kind. I can never remember the name but you aren't supposed to eat them until they are super mushy. Only here's the thing. . . you can dehydrate them when they are all orange but not soft yet and they taste like candy. My kids devour them all winter long. What a great post! You are right about it not starting all at once. Thanks for participating in this month's carnival and for providing the opportunity for us to focus on our progress over time. I've been thinking mostly about all the changes I still want to make (and beating myself up over several of them) so really appreciated the chance to review how far we have come since beginning our shift towards more sustainable living.